The 1996 Pichon-Lalande is just as awesome from bottle as it was from multiple cask tastings. 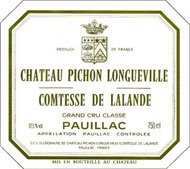 For Pichon-Lalande, the percentage of Cabernet Sauvignon is atypically high. This wine normally contains 35-50% Merlot in the blend, but the 1996 is a blend of 75% Cabernet Sauvignon, 15% Merlot, 5% Cabernet Franc, and 5% Petit Verdot. Only 50% of the estate''s production made it into the grand vin. The color is a saturated ruby/purple. The nose suggests sweet, nearly overripe Cabernet Sauvignon, with its blueberry/blackberry/cassis scents intermixed with high quality, subtle, toasty new oak. Deep and full-bodied, with fabulous concentration and a sweet, opulent texture, this wine was singing in full harmony when I tasted it in January. Given the wine''s abnormally high percentage of Cabernet Sauvignon, I would suspect it will close down. It possesses plenty of tannin, but the wine's overwhelming fruit richness dominates its personality. Anticipated maturity: 2004-2025. Tasted at the Chapon Fin restaurant in Bordeaux. This remains my benchmark Pichon Lalande in recent years. It is that essence of untrammelled Cabernet Sauvignon that governs the bouquet: blackberry, cigar box, cedar and a touch of mint – pure Pauillac heaven. The palate is a little foursquare on the entry, but there is also an unerring symmetry that is utterly captivating. What is more, one feels that it has barely started to flex its “muscles”. Tasted September 2011. What a treat it is to taste these two Pichon Lalandes straight from the chateau’s cellar. The 1996 Pichon Lalande is stratospheric from the very first taste. The deep, layered bouquet alone is deeply transfixing. Smoke, mocha, dark spices, lavender, crème de cassis, a host of dark-fleshed fruits and a touch of warm, resonant sweetness from the French oak draw me in. All of those sensations follow through to the palate, where the wine is massive, intense and totally enveloping. Time has softened the tannins to the point the 1996 is ready to drink, but there is enough sheer concentration here to support another 20-30 years of exceptional drinking. I am not sure I possess the vocabulary to describe just how captivating the 1996 is, but I do know this: If I had an opportunity to pick up a few well-stored bottles I would take it in a nanosecond. Readers holding the 1996 should be thrilled. The 1996 Pichon Lalande is a magnificent wine with plenty of upside. In word: fabulous.